The Niagara Falls lies on the border between the Canadian province of Ontario and the state of New York in the US, and is one of the most impressive and visited water falls in the world. Over 4 million cubic feet of water tumbles over the falls every minute, making it one of the most impressive natural wonders known to humans. The Niagara falls is actually a misnomer since there are in fact three falls at the same position on the Niagara river, two of them, the American falls and the Bridal Veil falls on the US side between mainland New York and Goat Island, a small island in the Niagara river, and the third falls known as Horseshoe falls which split between America and Canada and lies on the main river course. 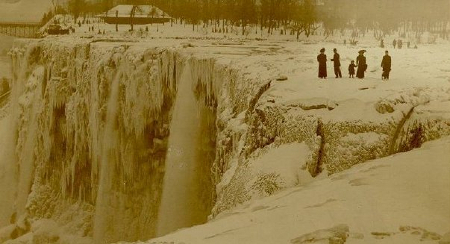 During the last ice age the ice shelf extended all the way past the Great Lakes and the current location of the falls, geologists believe the ice was as thick as 2-3 miles, but as the the ice retreated the Niagara river was created from melted river flow which carved it’s own course on the way down to the Atlantic. It is considered one of the youngest rivers in the world at only 12,000 years old. The falls were created only a few thousand years ago thru erosion, the riverbed and falls are a mixture of limestone and Lockport Dolostone, whilst the riverbed directly below the falls is made of softer shale and sandstone which has eroded much faster. 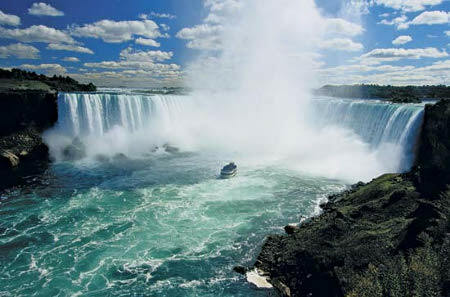 They are the second largest water fall in the world after the Victoria falls in Africa. Before British and American settlers arrived in the vicinity of the falls the local Indian tribe, the Iroquois, named the falls Onguiaahra, and historians believe this is where the name Niagara comes from. A french priest and explorer Louis Hennepin is believed to have been the first European person to see the falls in December 1678 although a few other explorers had seen the great lakes before him. As more people have had the opportunity to get to the falls, a few have attempted to defy nature and survive the punishing trip over the edge using barrels, life vests, and customized capsules, and whilst most have survived a few have drowned or been dashed against the rocks at the base of the falls. The first person to go over the falls into the pool below was a Michigan school teacher by the name of Annie Taylor in 1901, at the not so young age of 63.